These beautiful fossils were found in York State Park by Mae Kemsley (’16). It was a surprise gift I found on my doorstep! 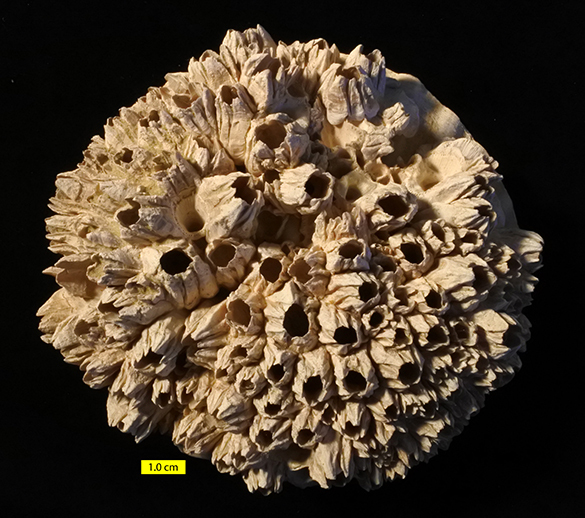 They are fossil barnacles completely covering the exterior of a valve of the pectenid bivalve Chesapecten middlesexensis (Mansfield, 1936) from the Upper Pliocene. 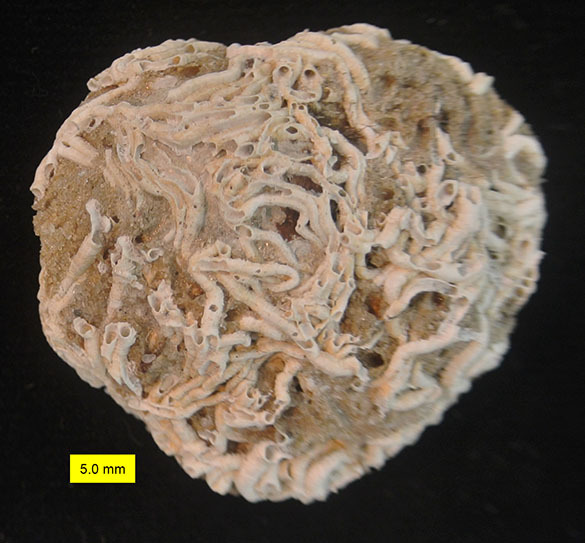 An excellent example of an ancient sclerobiont community. This is the reverse of the specimen, showing the interior of the host shell. Note the large single muscle scar typical of monomyarian pectenid bivalves. Chesapecten is well known among paleontologists. The genus preserves a distinct evolutionary sequence, as seen in the above famous figure from Ward and Blackwelder (1975). This image has been reproduced in countless articles and textbooks. Chesapecten was also the first fossil from North America to be illustrated in a scientific publication. 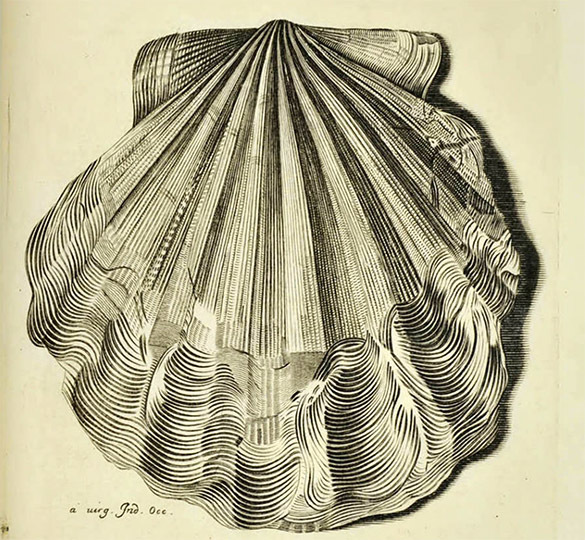 The above image of what we now know as Chesapecten jeffersonius was illustrated in the third volume of Martin Lister’s Historiae Conchyliorum in 1687. 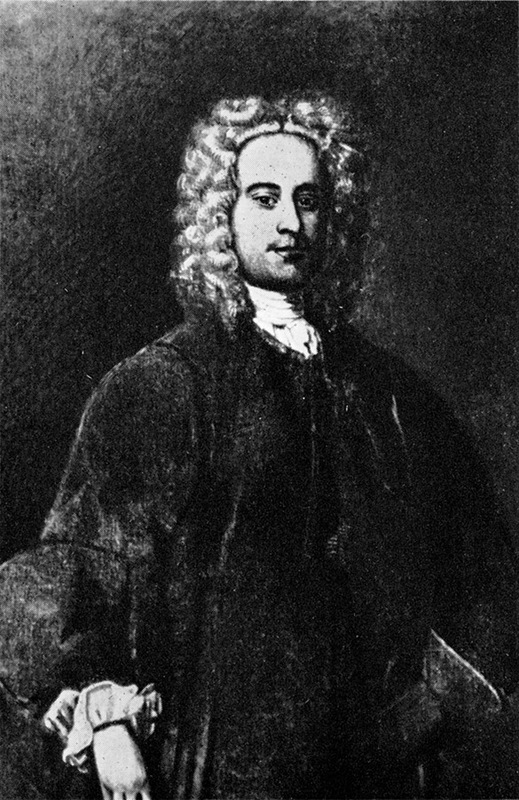 Martin Lister FRS (1639 – 1712) was a natural historian and physician born into a prominent family in Radcliffe, England. His father, Sir Martin Lister, was a member of the Long Parliament in the eventful politics of mid-17th century England. He was a nephew of James Temple, a regicide (or patriot, take your choice) and Sir Matthew Lister, physician to Charles I (victim of said regicide). These were just a few of his family connections to politics and science. Martin Lister was graduated from St John’s College, Cambridge, in 1659, and a year later elected a fellow there. He served as a physician for many years in York, including three years as Queen Anne’s doctor. He became a Fellow of the Royal Society in 1671. He died in Epsom in 1712. Martin Lister was an extraordinary naturalist, becoming the first conchologist (one who studies shells) and arachnologist (a spider expert). He was a prolific writer, so we know much about what he did, how he worked, and his motivations. He discovered ballooning spiders and invented the ubiquitous histogram. For us his most significant work was Historiae Conchyliorum (1685-1692), which had 1062 plates engraved by his daughters, Anna and Susanna. 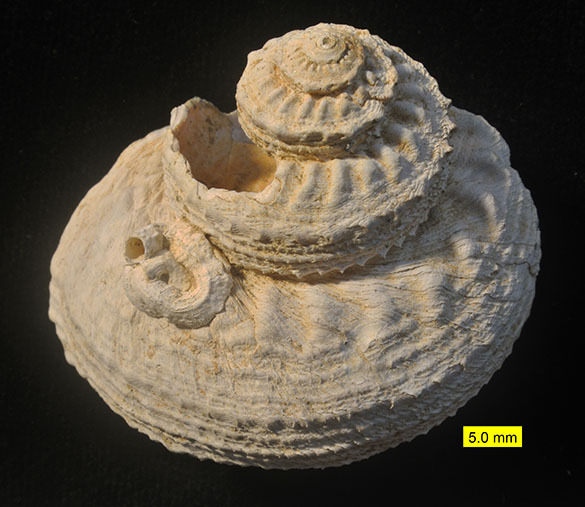 In keeping with his times, Lister noted the resemblances between fossil and modern shells, but believed the fossils were rocky replicas, not actual remnants of living organisms. He would no doubt be thrilled with our modern views of fossils and evolution. Kelley, P.H. 1983. 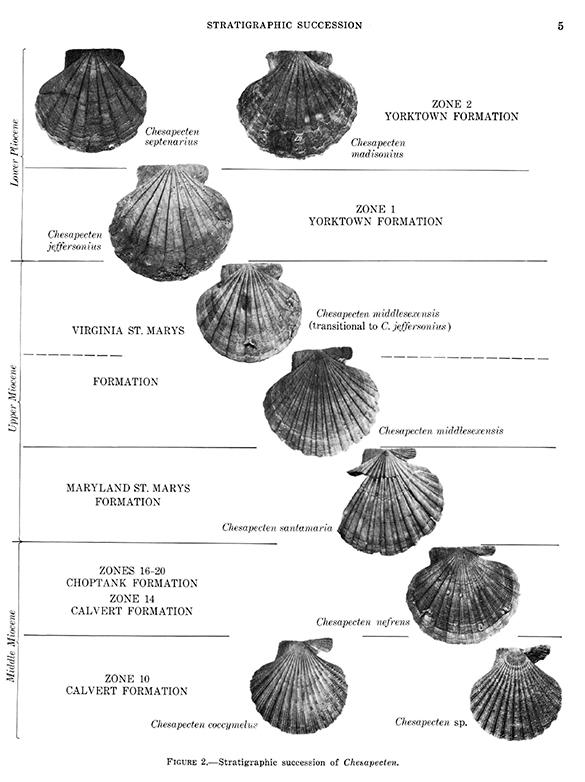 The role of within-species differentiation in macroevolution of Chesapeake Group bivalves. Paleobiology 9: 261-268. Lister, M. 1687. Historiae Conchyliorum, volume III. Londini, aere incisi, sumptibus authoris. 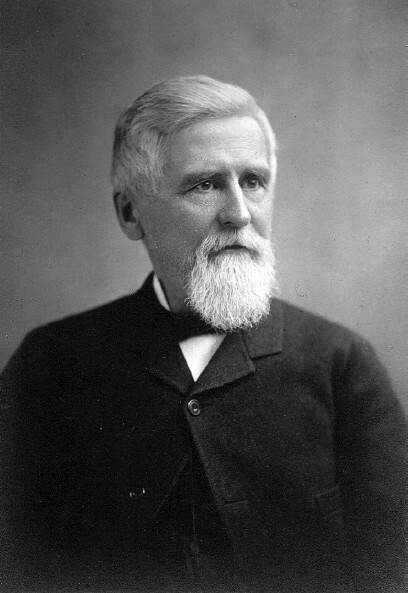 Ward, L.W. and Blackwelder, B.W. 1975. 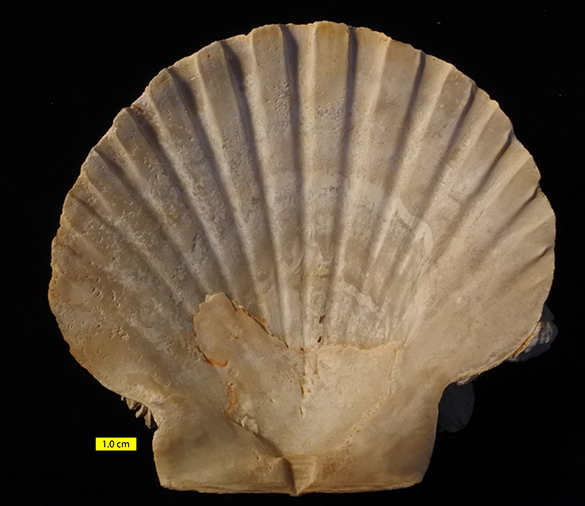 Chesapecten, a new genus of Pectinidae (Mollusca, Bivalvia) from the Miocene and Pliocene of eastern North America: USGS Professional Paper 861. US Government Printing Office. This week’s fossil comes from our teaching collection. It’s label appears to be from the late 19th Century. 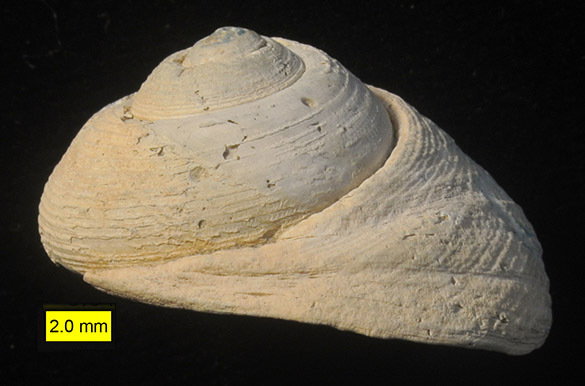 It is a naticid gastropod (“moon snail“) listed as Polinices galianor. That name, which I can only find in two lists and never with an author, may be a corruption of Polinices (Euspira) galianoi Dall 1909. 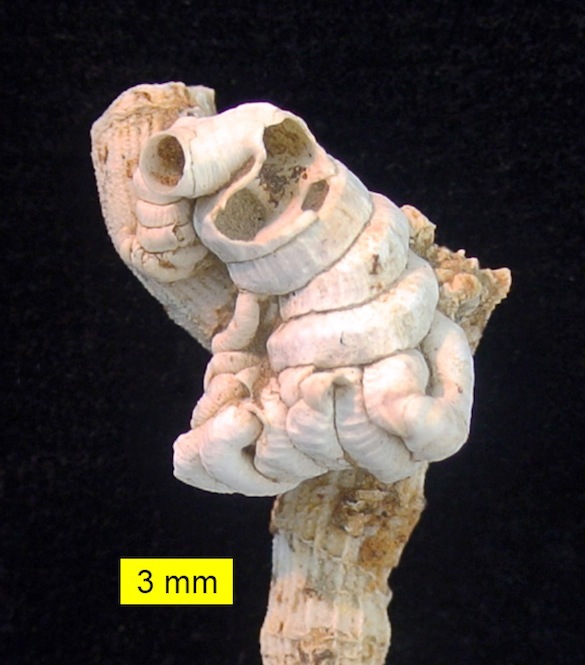 It was collected from the Pliocene of San Diego County, California. It is preserved as both an internal mold and thin sheets of remnant original shell. This is a view of the underside along the axis of coiling. The hole is known as the umbilicus and is distinctive for the naticids. These snails are predatory, moving through loose sand with a very large foot and capturing shelled prey, like clams and other gastropods. They then drill a beveled hold through the shell of the prey with specialized teeth in their radulae. We’ve discussed the trace fossils they leave (Oichnus) in a previous post. 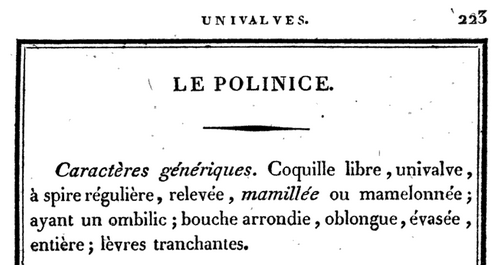 The genus Polinices was named in 1810 by Pierre Dénys de Montfort (1766–1820), a French malacologist (one who studies mollusks). The title page of de Monfort (1810). This brief paragraph is all it took in the early 19th Century to name a new taxon. The system is much more elaborate now. Pierre Dénys de Montfort is a tragic figure in science. First, he had the misfortune of being a French intellectual during the chaos of the French Revolution and the resulting Napoleonic dictatorship. Scientists struggled then, but after service in the revolutionary army and an apprenticeship with a geologist, de Monfort gained a position in the Jardin des Plantes, a research botanical garden in Paris. He did a massive study of mollusks, producing systematic tomes. 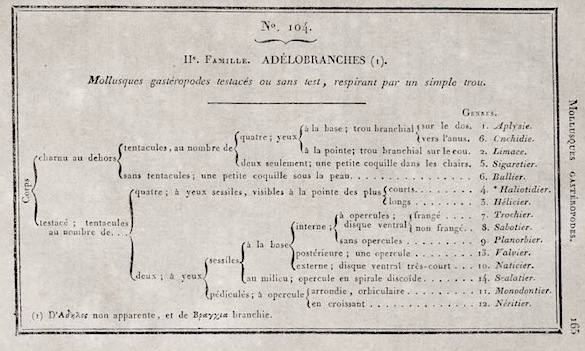 De Monfort was a whiz at languages, so he did well as a translator after Napoleon was finally defeated in 1815 and the Allied armies occupied Paris. Then he went off the rails. 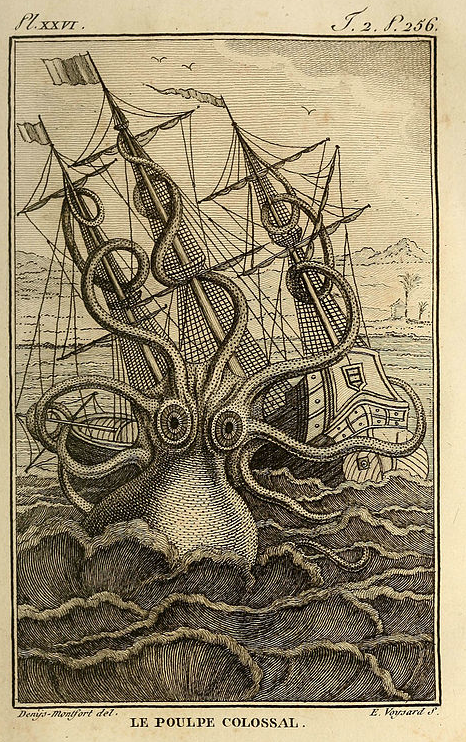 He had since 1801 championed the reports of mariners that giant cephalopods occasionally rose from the sea and attacked shipping, as shown in his above print (de Monfort, 1801, p. 256). The modern roots of the kraken! De Monfort took the idea too far, was ridiculed in the scientific community, and eventually died of starvation and alcoholism in the streets of Paris in 1820. The later discovery of giant squid salvaged his reputation a bit, but no one has yet found evidence of “le poulpe colossal”. Dall, W.H. 1909. Contributions to the Tertiary paleontology of the Pacific coast. U.S. Geological Survey Professional Paper 59. U.S. Government Printing Office, 288 pages. de Montfort, P.D. 1801. 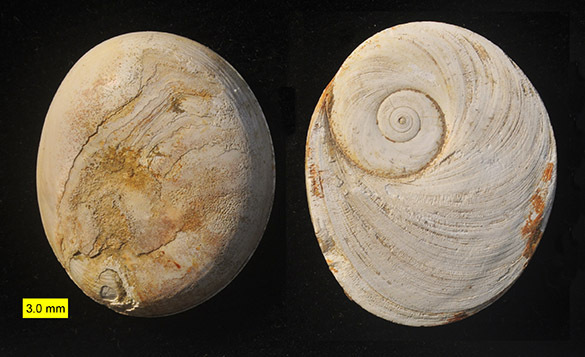 Histoire naturelle, générale et particuliere des Mollusques, animaux sans vertèbres et á sang blanc. Volume 2. Paris, 424 pages. de Montfort, P.D. 1810. 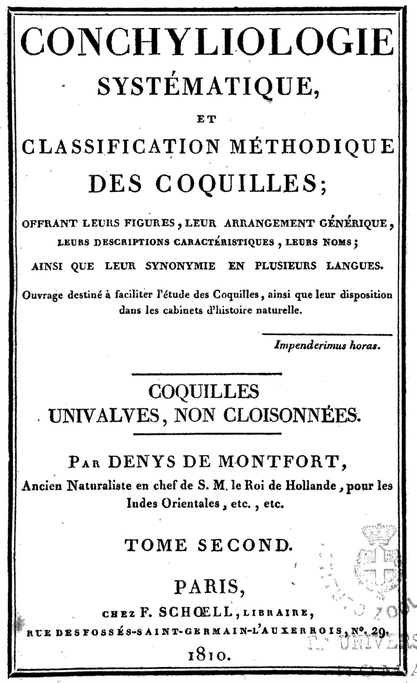 Conchyliologie systématique, et classification méthodique de coquilles. Volume 2. Paris, 692 pages. This past semester I worked with three colleagues on a massive trace fossil review paper, which we hope meets success in the next month or so. My primary job on the team was to sort out bioerosion traces, especially those that are macroscopic. As always with such studies, I learned a great deal when forced to do a systematic literature review. 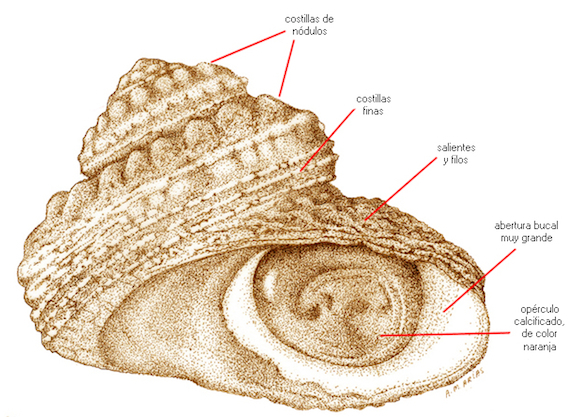 One of the ichnogenera new to me was Caedichnus, a wedge-shaped excision found primarily in gastropod shells. It was only described last year by Stafford et al. (2015). Above is an example we happened to have in our collections. 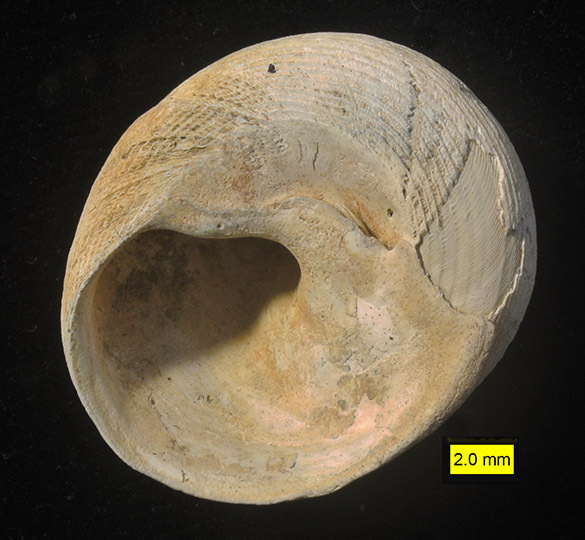 Note the fractured margins in this Fusinus shell aperture from the Pliocene of Cyprus. It was likely made by a predatory crustacean (such as a crab or lobster) bashing away at the shell to get to the living snail inside. The predator may have been successful in this case since there is no sign of healing in the snail shell. Above is an undamaged Fusinus showing a complete aperture. This snail also had its travails, though. Note the round, incomplete borehole just above the aperture. This was made by some kind of drilling predator, likely a naticid snail. 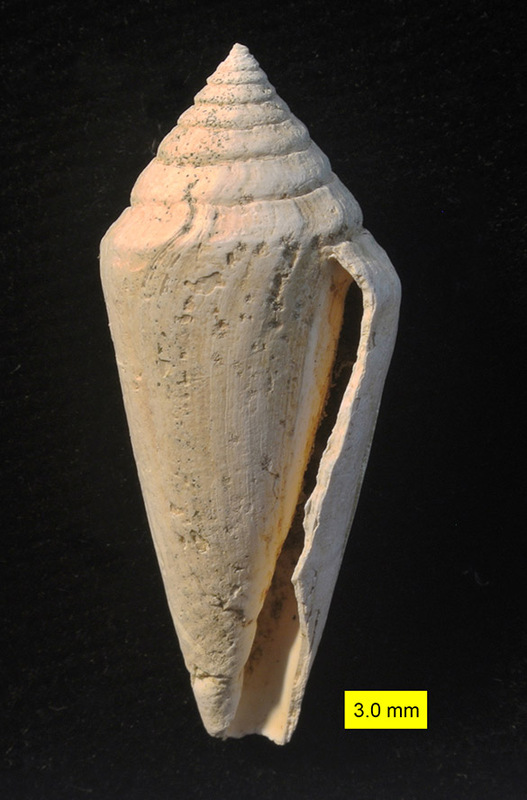 These shells come from the 1996 Wooster-Keck expedition to Cyprus with Steve Dornbos (’97) and me. 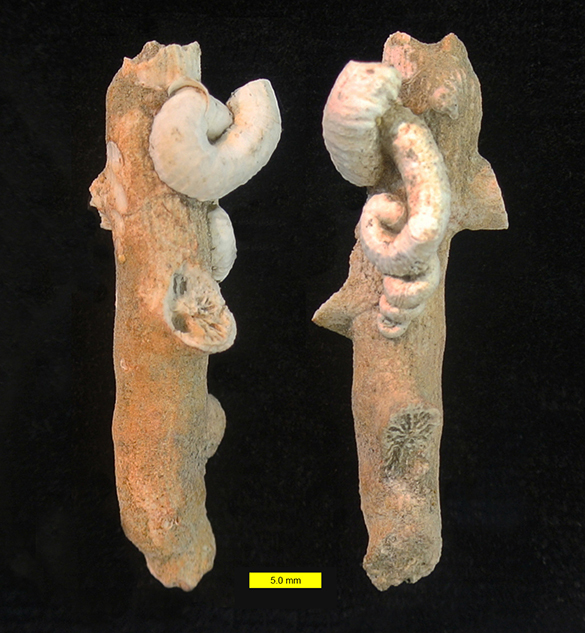 Like the rest of the Cypriot specimens on this blog, it is from the Nicosia Formation (Pliocene) exposed on the Mesaoria Plain in the center of the island. 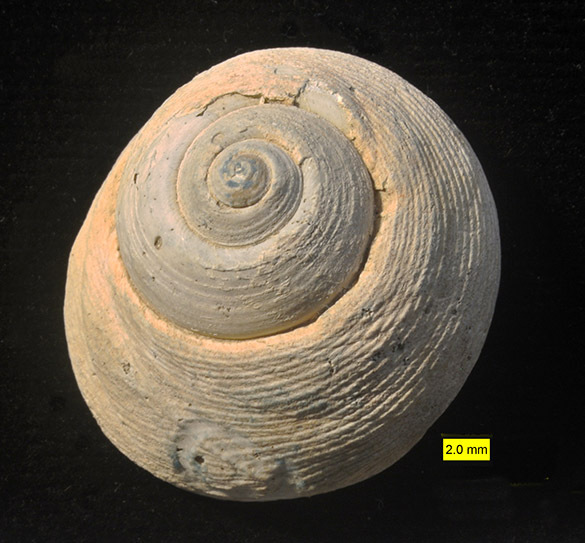 This specimen comes from the “Exploration” locality described in Dornbos and Wilson (1999). Molinaro, D.J., Stafford, E.S., Collins, B.M., Barclay, K.M., Tyler, C.L. and Leighton, L.R. 2014. Peeling out predation intensity in the fossil record: A test of repair scar frequency as a suitable proxy for predation pressure along a modern predation gradient. Palaeogeography, Palaeoclimatology, Palaeoecology 412: 141-147. Stafford, E.S., Dietl, G.P., Gingras, M.P. and Leighton, L.R. 2015. 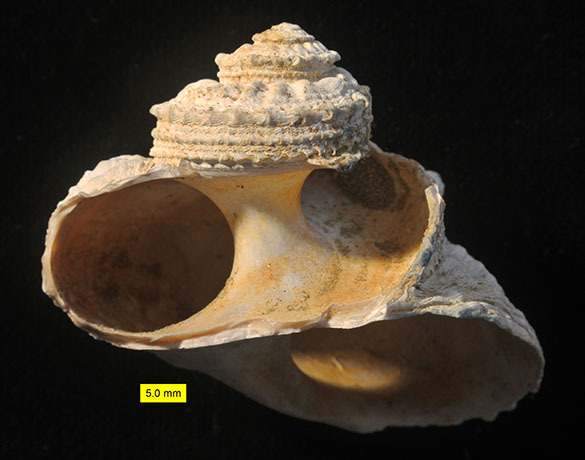 Caedichnus, a new ichnogenus representing predatory attack on the gastropod shell aperture. Ichnos 22: 87-102. Stafford, E.S., Tyler, C.L. and Leighton, L.R. 2015. Gastropod shell repair tracks predator abundance. Marine Ecology 36: 1176-1184. In this side view the growth lines are evident (they are parallel to the aperture; the thin ribs following the whorls are ornamentation), as are a couple of shallow, circular pits drilled by some unsuccessful predator. That predator could have been another gastropod or even an octopus. The pits are known by the trace fossil name Oichnus. Those growth lines are interesting in this genus. Schöne et al. (2007) studied a species of modern Gibbula and determined that they formed “microgrowth lines” in association with tidal cycles, forming “distinct fortnight bundles of microgrowth increments and lines”. We would need to section this shell and examine it microscopically to see such patterns. Here is the basal view of our Gibbula specimen. 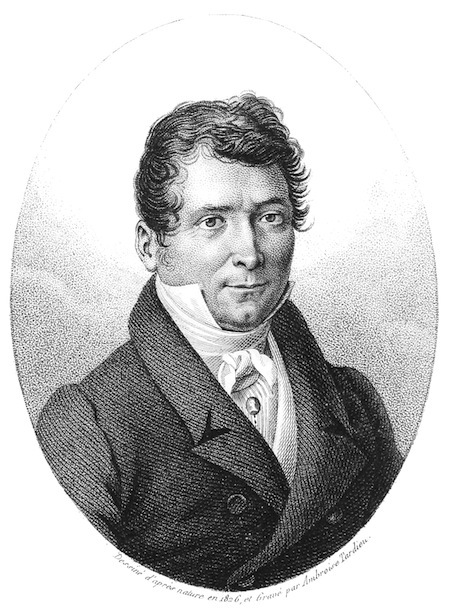 The genus Gibbula was named and described by Giuseppe Antonio Risso (1777-1845), called Antoine Risso, was a productive Italian (more or less; he later can be considered French) naturalist. He was born in the city of Nice, then in the Duchy of Savoy. In 1792, soon after the French Army occupied Nice, Risso became a pharmacist’s apprentice, which encouraged his interest in medicinal botany. Risso was also a pioneering mountaineer in the Alps and other European ranges. He published several books on invertebrates, fish and plants. The work most relevant to us is his 1826 tome entitled: Histoire naturelle des principales productions de l’Europe Méridionale et particulièrement de celles des environs de Nice et des Alpes Maritimes. Risso’s Dolphin is named after him. Risso, A. 1826. Histoire naturelle des principales productions de l’Europe Méridionale et particulièrement de celles des environs de Nice et des Alpes Maritimes. Paris: F.G. Levrault. Vol. 4: IV, 1-439, 12 pls. Schöne, B.R., Rodland, D.L., Wehrmann, A., Heidel, B., Oschmann, W., Zhang, Z., Fiebig, J. and Beck, L. 2007. 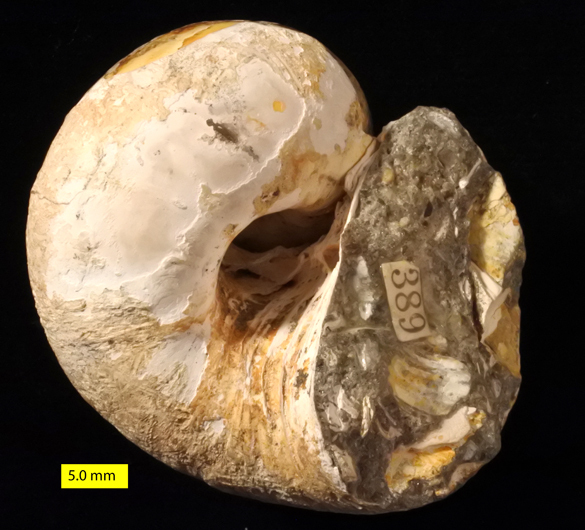 Combined sclerochronologic and oxygen isotope analysis of gastropod shells (Gibbula cineraria, North Sea): life-history traits and utility as a high-resolution environmental archive for kelp forests. Marine Biology 150: 1237-1252. Williams, E.E. 1964. The growth and distribution of Gibbula umbilicalis (da Costa) on a rocky shore in Wales. The Journal of Animal Ecology 33: 433-442. Cyprus again for this week’s fossil. 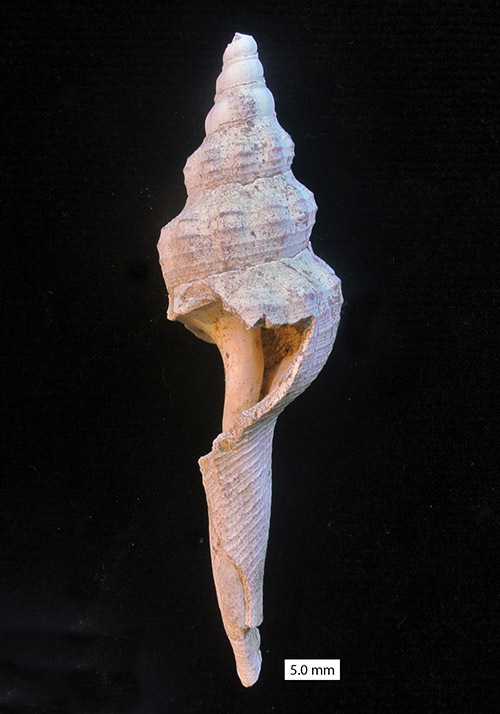 This is a nearly complete shell of the predatory snail Conus pelagicus Brocchi 1814 found at the Epsilos exposure of the Nicosia Formation (Pliocene) on the Mesaoria Plain of central Cyprus by Steve Dornbos (’97) and me in 1996. In life this species no doubt had an intricate shell color pattern, as their cousins do today. 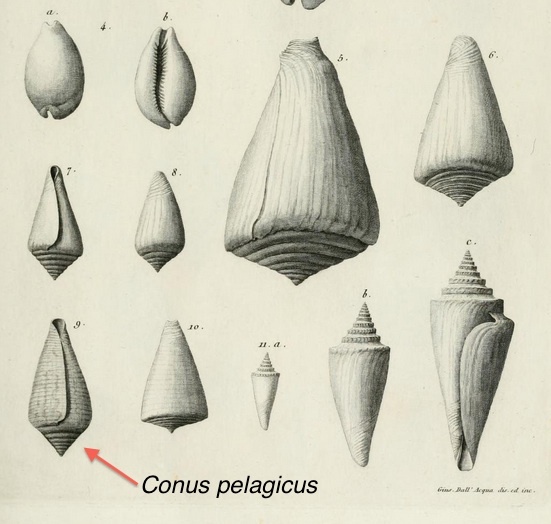 The taxonomic intricacies of the genus Conus are far beyond the scope of a mere blog entry, so I’ll simply link to a list of associated genera, subgenera and synonymies. Conus as an organism is fantastic. These are venomous predators famous for shooting radular teeth loaded with very effective toxins. Some species can kill a human in less than five minutes. No worries, though — the venom contains analgesic compounds so there is little pain. The best way to demonstrate the extraordinary killing process used by Conus is to look at a video. You’ll never look at snails the same way again. Above are drawings made by Brocchi of the conid (and a couple cypraeid) fossils he found in the Apennines during his extensive study published in 1814. Note that in the Continental fashion still followed today, the shells are figured aperture-up. Americans and the rest of the English-speaking world orient them in the proper way. Figures 11a, b and c, though, are oriented in the opposite direction, maybe to fill the space efficiently. We return to Cyprus for this week’s fossil. 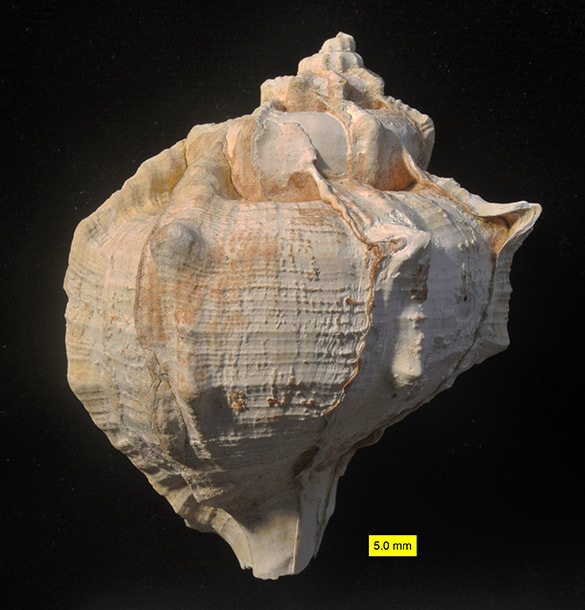 This is a broken shell of the predatory muricid Bolinus brandaris (Linnaeus, 1758) found at the Coral Reef exposure of the Nicosia Formation (Pliocene) on the Mesaoria Plain of central Cyprus by Steve Dornbos (’97) and myself in 1996. It has had some significant battering, probably by a crab peeling away the shell to get to the goodies. The ribs are prominent on the whorls, representing previous strengthened apertures. The base was a long, narrow siphonal canal now broken off. You can see the complete shell shape in modern examples. 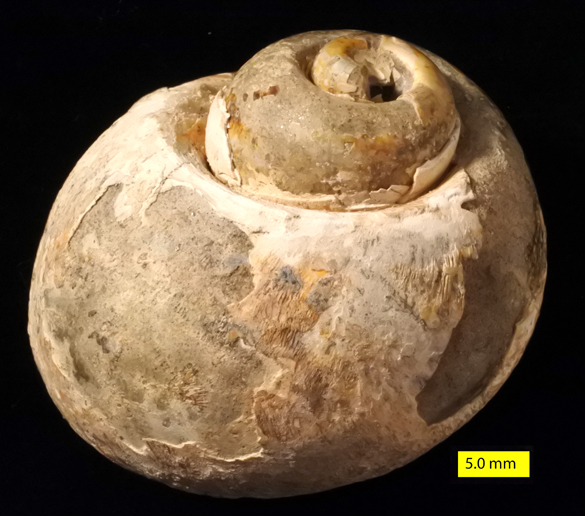 On the other side of the same specimen we see that the last whorl has been opened, showing the spiral columella at the axis of coiling. The arrow points to a puncture hole in an upper whorl. This appears to be the result of a “ballistic” impact on the shell by some predatory organism. Pether (1995) gave the name Belichnus to this trace fossil, attributing it to stomatopod crustaceans and their wicked-fast and powerful claws. Cadée and de Wolf (2013) expanded the possible tracemakers of Belichnus to seagulls. 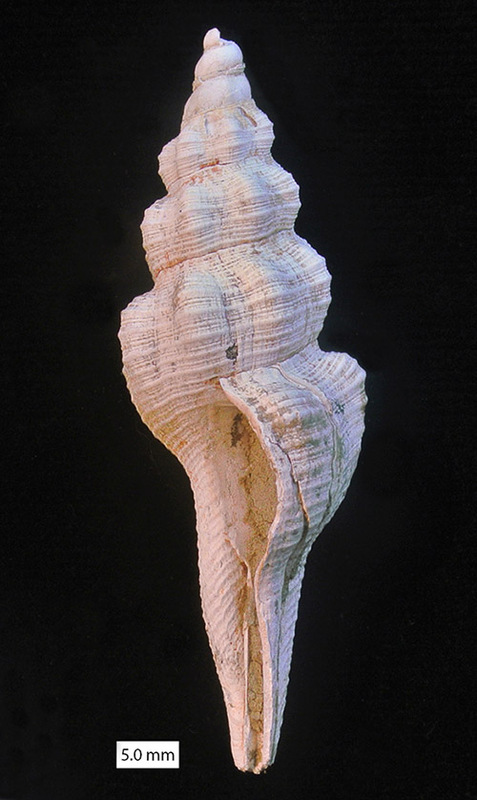 Bolinus brandaris is well known today throughout the Mediterranean as the Purple Dye Murex. It has been used since ancient times as the source of a deep, permanent fabric dye called Tyrian Purple. It was highly prized by royalty and the wealthy elite for millennia. 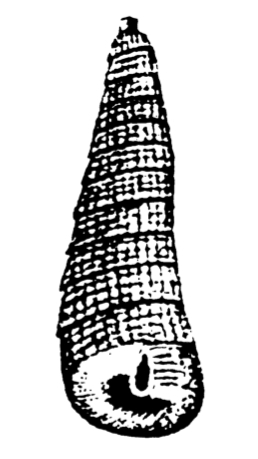 Linnaeus originally placed this species in the genus Murex, but in 1837 Georg Gottlieb Pusch described a new but similar genus Bolinus, to which the species now belongs. Pusch, who also had the Polish name Jerzy Bogumił Koreński, was a very interesting fellow in the early days of paleontology and geology. He was born in Kohren, Saxony, in 1790 (or 1791, depending on which calendar you use). He was very early interested in what would become geology, so in 1806 he enrolled in the Mining Academy in Freiberg. In his first year he was recognized as an outstanding student by the famous Abraham Gottlob Werner. In 1811 he also studied law in Leipzig. After graduating he explored the geology of Saxony, and in 1813 participated in battles against Napoleon. Then in 1816, Pusch moved to Poland, which at that time was partitioned by foreign powers. He became professor of Chemistry and Metallurgy at the Kielce Academy and later head of the Mining and Mineralogy Department in Warsaw. His most important geological work was to explore and describe the geology of the Carpathians. He died in 1846. 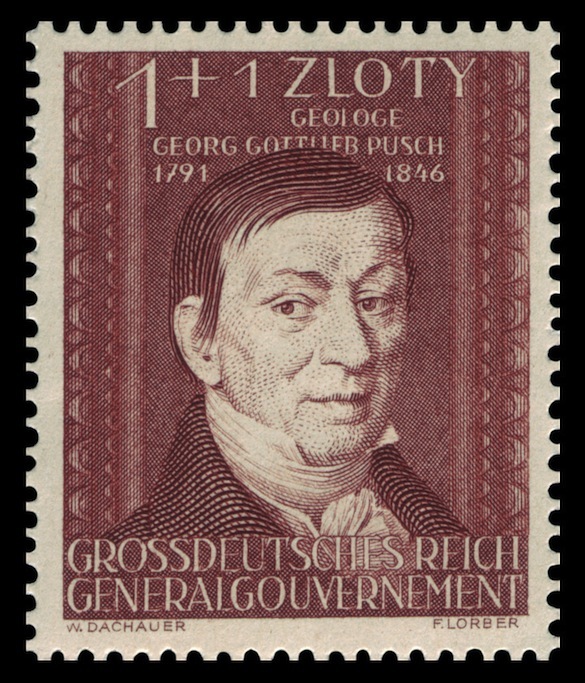 To his misfortune, a portrait of Georg Gottlieb Pusch was used on the above 1944 German Occupation of Poland postage stamp, probably for the simple reason that he was a German who had done well in the Polish territories. I like to think Pusch would have been appalled to have been used in this way. He was a hero of geology. Cadée, G. C. and de Wolf, P. 2013. Belichnus traces produced on shells of the bivalve Lutraria lutraria by gulls. Ichnos 20: 15-18. Pether, J. 1995. 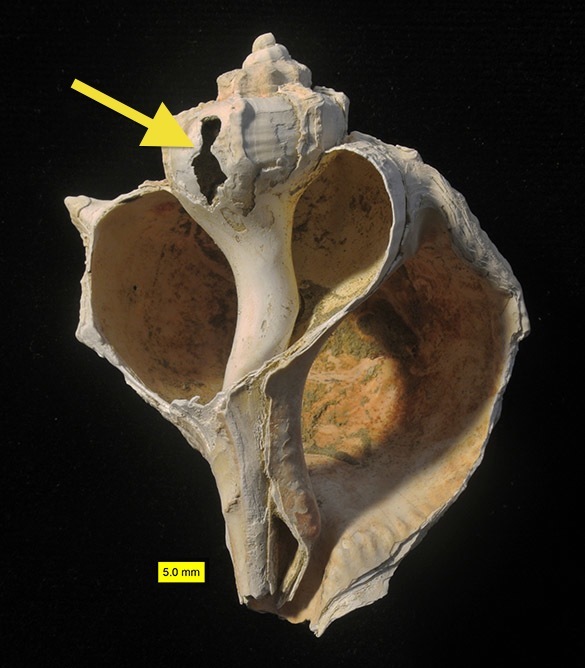 Belichnus new ichnogenus, a ballistic trace on mollusc shells from the Holocene of the Benguela region, South Africa. Journal of Paleontology 69: 171-181. Radwin, G.E. and D’Attilio, A. 1986. Murex shells of the world. An illustrated guide to the Muricidae. Stanford University Press, Stanford, 284 pages. 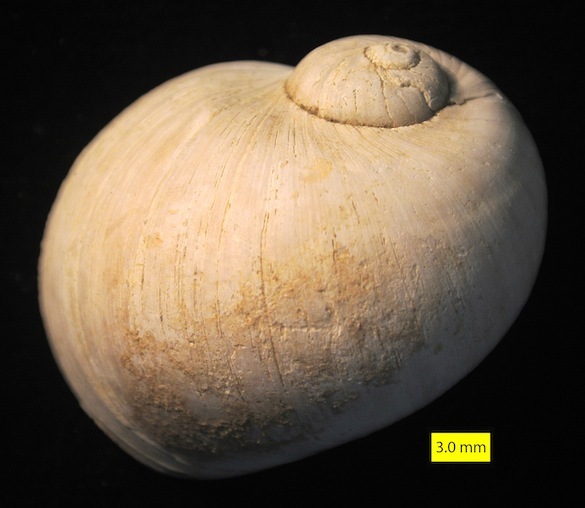 This week we have another fossil from the Nicosia Formation (Pliocene) of the Mesaoria Plain in central Cyprus. It is again from a Keck Geology Consortium project in 1996 with Steve Dornbos (’97). This time, though, instead of our Coral Reef locality, our featured creature is from a sandy marl outcrop we called “Exploration”. We have above an aperture view of Naticarius millepunctatus Risso, 1826, a species still alive today and known as the “many-spotted moon shell”. It is a naticid gastropod, heir to a predatory tradition that strikes fear in the tiny hearts of bivalves. 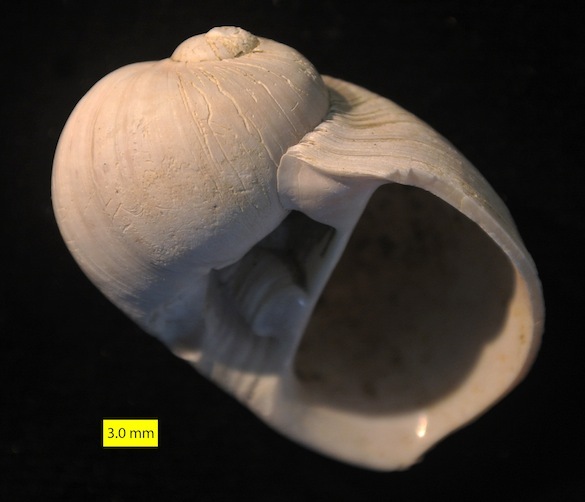 Naticid gastropods, like our Naticarius, have a well-muscled foot that they use to essentially swim through loose sand to capture infaunal bivalves and other shelled prey. They then use their specialized radula to drill into the shell, kill the unfortunate animal, and then consume the soft goodies. Naticids leave distinct drill holes in the shells of their victims, as shown in a previous Fossil of the Week post. We found a few drilled bivalve shells with our Naticarius millepunctatus at the Exploration site. 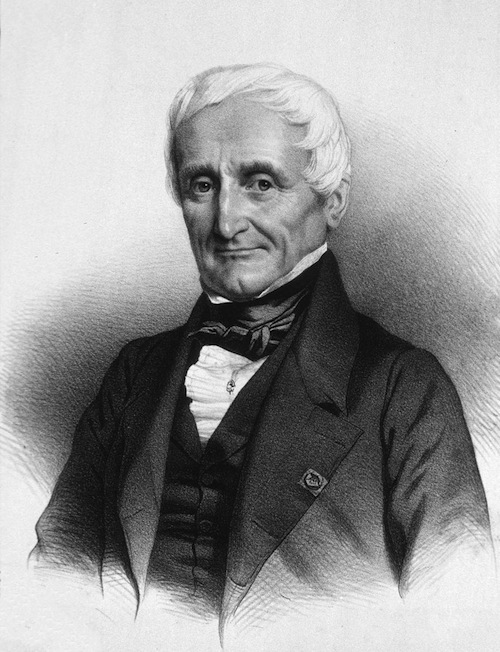 Naticarius was named as a genus in 1806 by André Marie Constant Duméril (1774-1860). 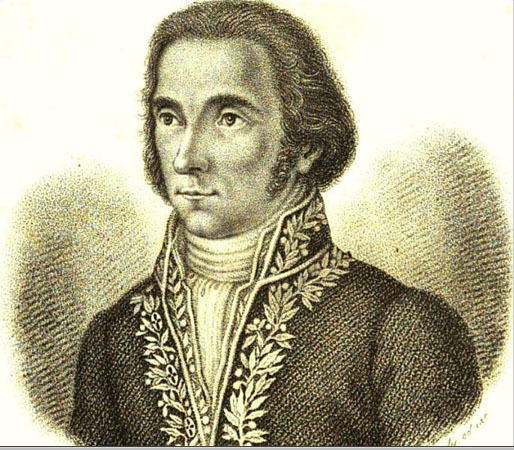 Duméril was another member of that marvelous group of French zoologists that lived through the French Revolution. He was a professor of anatomy, herpetology and ichthyology at the Muséum National d’Histoire Naturelle in Paris, corresponding and collaborating with such eminents as Georges Cuvier and Alexandre Brongniart. His most prominent work was Zoologie analytique, published in 1806. In this massive treatise he compiled descriptions of all the known genera of animals in an effort to sort them out in a repeatable way. André Marie Constant Duméril did prodigious work with reptiles as well, describing in detail 1393 “species” over nine volumes. (Oddly, in defiance of his fellow zoologists, he insisted that amphibians should be counted among the reptiles, thus the quotes around his number of “reptiles”.) Duméril also had major works on insects. His son, Auguste Duméril, was also a zoologist. As the elder Duméril retired, Auguste gradually took over his scientific projects. Cowper Reed, F.R. 1935. LII.—Notes on the Neogene Faunas of Cyprus.—III. The Pliocene Faunas. Journal of Natural History 16: 489-524. Duméril, C. 1806. Zoologie analytique, ou Méthode naturelle de classification des animaux, rendue plus facile à l’aide de tableaux synoptiques. Allais, Paris. 344 pp.